The weather today was not my friend as I arose and contemplated my run into the woods. 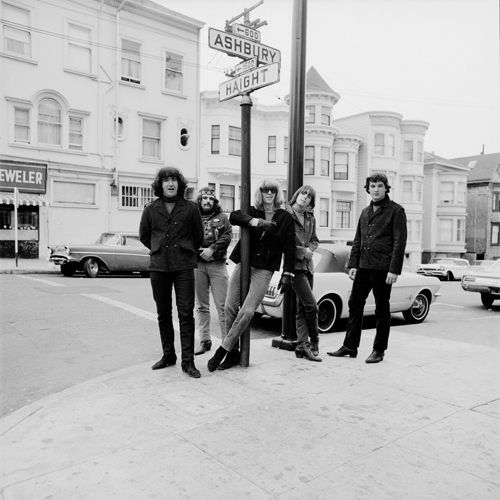 It was cold and rainy, and there’s nothing like a cold November rain to dispirit even the most spirited of souls. 😦 And besides that, I left home with a small bit of guilt, as I would be leaving my girlfriend Catherine behind for several hours while I went and knocked out the run. Today was another “cleanup” run, and would cover four previously missed segments of named trails that I had not quite (but nearly) completed. 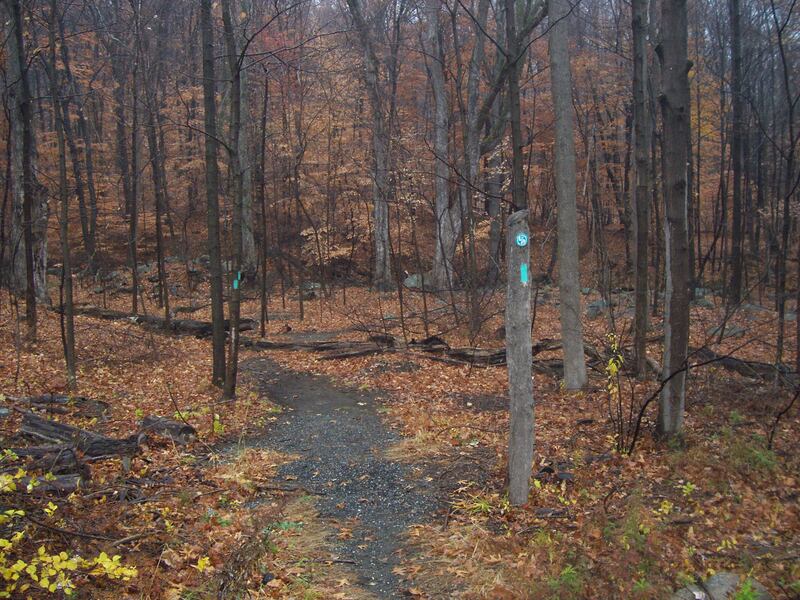 The starting point would be Harriman State Park‘s easternmost portion of the Long Path. For those who don’t know, the Long Path is essentially New York’s answer to Vermont’s more famous Long Trail. The LP runs from the George Washington Bridge in New Jersey to Boyd Thacher State Park, just south of Albany, NY, comprising 347 miles in all. 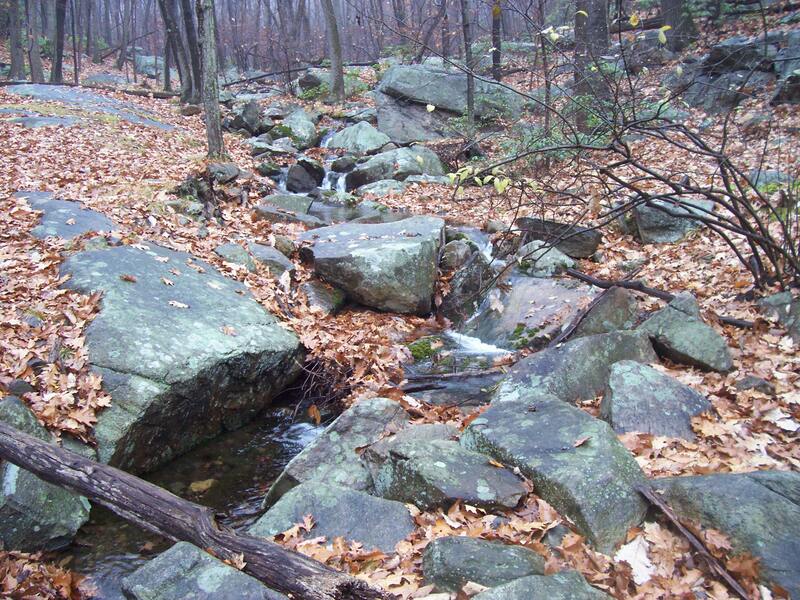 Approximately 25 of those miles lie within the boundaries of Harriman State Park. And so, my first stop was along Call Hollow Rd, also known as Rockland County Route 75. As I locked up the car and stepped out onto the trail, the very first step on this out-and-back section was to cross a creek. Having done that without getting my feet wet, the trail turned left and began a gradual (and deceptively challenging) 600-ft vertical climb to the base of Big Hill, at the junction of the Suffern-Bear Mountain Trail. Along the way, I would cross another stream, and also a woods road known as Old Turnpike. The water in the streams was flowing with lots of volume, a testimony again to the rains we’d been having over the past several weeks. I felt a sense of perfection in seeing the water flow over the rocks, creating magnificent sways and eddies as it did. 🙂 This – I thought – is how nature is supposed to be! When I finally reached the turnaround point, I decided that I needed to conserve some energy for the second ‘episode’ in today’s endeavor – a roundabout run over near Lake Skanatati – so in lieu of a return trip on the Long Path, I headed back via the Old Turnpike. It was downhill all the way, and although I periodically had to run around large rivulets that had washed over the trail, the going was relatively easy. 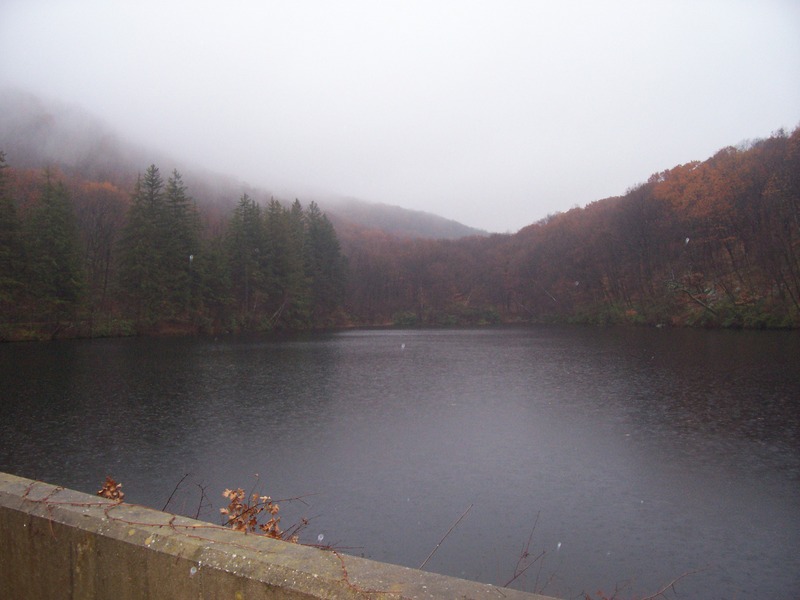 Less than half a mile from the car, I passed First Reservoir, and it was at this point that the rains – which had pleasantly stopped for a while – returned with a steadiness that made me frown. 😦 So I made haste now, wanting to get back to Maxine and inside her (put your dirty minds in check, please) to warm up for a bit. Despite having worn my gloves, my fingers had gone numb on me, and were stinging by the time the car’s engine began pushing warm air into Maxine’s cabin. Amid my “digital discomfort,” I contemplated calling it a day at this point and skipping today’s Part Two. But my sense of discipline returned, and I began the drive over to Lake Skanatati. When I arrived in the parking lot there 10 minutes later, the rain hadn’t stopped, but it was what I’ll call “manageable” on this cold November day, so I stepped out of the car, slapped my Hydrapak on, and off I went. With perhaps another hour’s worth of running, and some good fortune, I would be able to cross the Long Path, the Ramapo-Dunderberg Trail, and the Dunning Trail off of my list! Moving beyond the Dunning Trail junction, I continued on the Long Path, passing an impressive rock formation called Cape Horn as I did. With the darkening late afternoon skies and the cold damp weather, I suddenly felt a sense of isolation and uneasiness that I rarely feel when I’m running these trails. Paranoia set in, and thinking that some mountain vagabond might jump out from behind a rock and attack me, I ran with a sense of caution and urgency. That feeling of apprehension carried me all the way to the next trail junction, an intersection known to those who hike this area as Times Square. It’s no mystery as to how Times Square acquired its busy-sounding name. 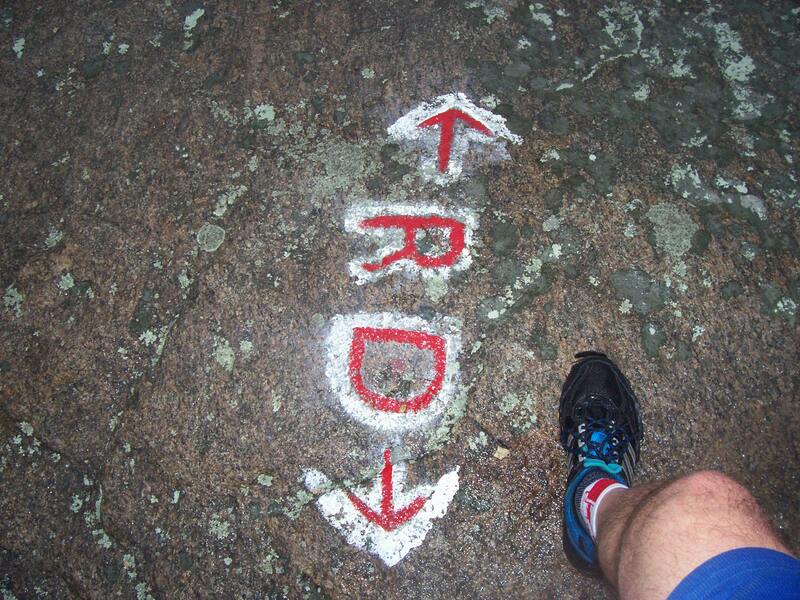 At this junction, three trails (The Long Path, the Ramapo-Dunderberg and the Arden-Surebridge) all meet. In fact, there are so many directionals here that’s it’s good idea to consult your trail map to be sure of where it is you want to go next. Having been here several times before, I had a sense of comfort in knowing where I needed to go, and that was a hard left-hand turn onto the Ramapo-Dunderberg Trail. From here I began a short but rocky segment that would complete the R-D for me once and for all! 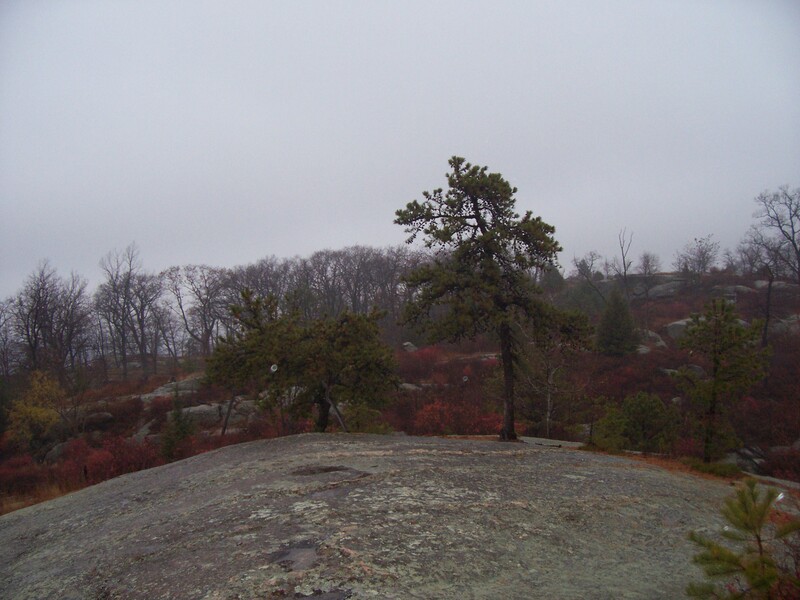 Up a steep incline at the start, I then rambled over an undulating rock ridge that would bring me to the junction of the Lichen Trail. I had run the Lichen with Catherine back in May, and then with my friend Todd in July. Both of those occasions had been sunny and hot. Today, the weather was bitingly cold, so my goal was simply to get it done (preferably without slipping and falling on the rocks) and then get the hell out of Dodge! With eyes ever on the lookout for it, I spied the head of the Dunning Trail on my right, just before a stream crossing, and with a smile on my face rooted in the satisfaction of a job well done, made the turn toward the Pine Swamp. 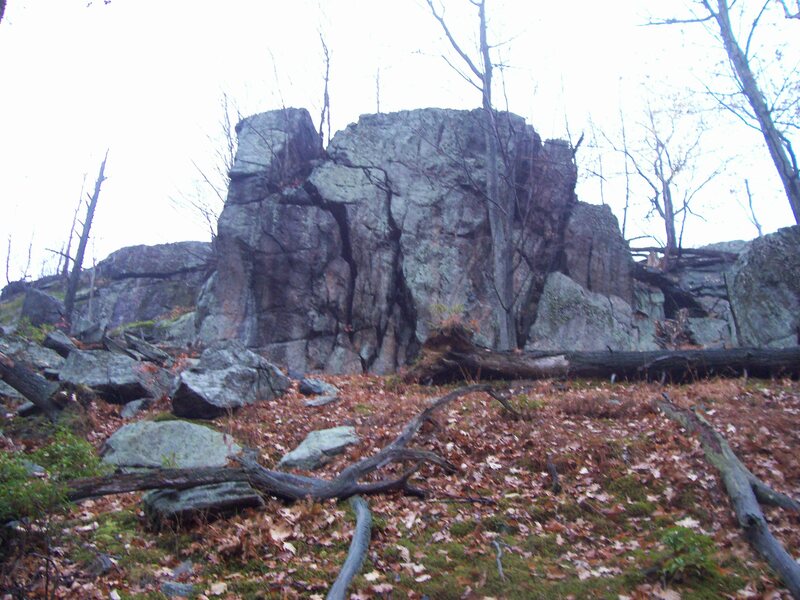 From here I would follow the Dunning past Pine Swamp and back to the Long Path, and then run the LP back to the car. I had been looking at these last three pieces of trail on my map since the late summer, wondering when I would finally get around to doing them. Well, today was the day, and the really crappy running conditions gave me a heightened sense of accomplishment. When I arrived back at the Lake Skanatati parking lot, all three cars that I had seen when I had first parked here were now gone. Yes indeed, I was the last of the idiots! With today’s dash into the woods, there would be just three runs left now and Harriman State Park would be mine to claim. My reward was nearly at hand! 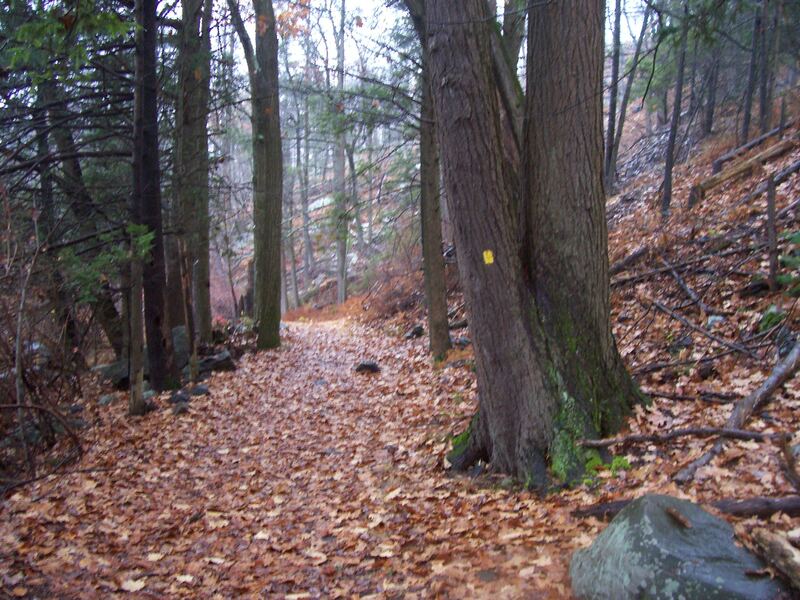 This entry was posted in Trail Running and tagged Dunning Trail, Harriman State Park, Lake Kanawauke, Lake Skanatati, Long Path, Pine Swamp, Ramapo-Dunderberg Trail, Suffern-Bear Mountain Trail, Times Square, trail running. Bookmark the permalink.